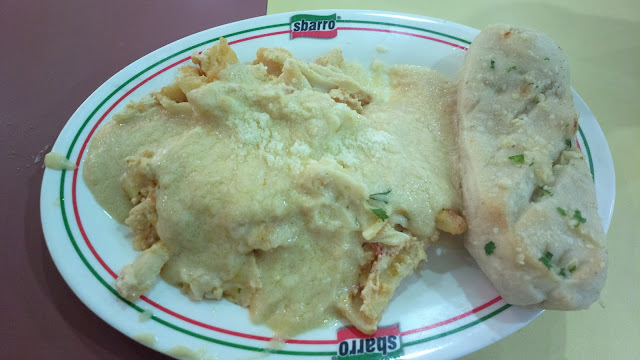 Merienda is solved with Sbarro and the meat lasagna with Alfredo sauce. If you're not into meat, you can switch to a different lasagna variant. You can also choose a different sauce such as the meat sauce or tomato sauce. The plate above was from a new branch at an SM mall food court. But I first found out about Sbarro in Festival Mall in Alabang. I've always enjoyed their white pizza (made of garlic, ricotta, and mozzarella toppings) ever since. For more information on Sbarro in the Philippines including the founding company's colorful background story, the complete menu of delectable Italian dishes, careers, and more, visit www.sbarro.ph or www.facebook.com/SbarroPhilippines .